Gosh I have been reading this book for 2 weeks, and I merely read 1/4 of it due to my busy schedule every weekday in college and various tests for my four subjects. My class starts at 8am and ends at 3 or 4pm every single day without fail, and I will be staying back after class for another one or two hour to finish my homework. Oh well, A-Levels life is so damn hectic, but heck, CPU life is even worst! Most of my housemates are CPU students, and everyday they have to discuss and do their coursework. Okay, stop ranting about hectic life of studying A-Levels. Oh yeah, I would like to recommend this book — Against The Gods cause this is indeed a book worth reading, if you had deep interest in reading the development of risk management since centuries ago. 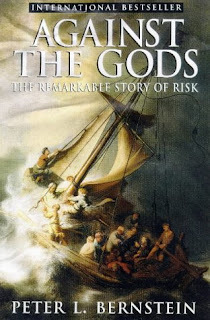 Ranging from the history of how renaissance people came out with the development of probability theories by as simple as throwing dice to the contemporary risk management methods, this is definitely a book that you wouldn’t want to miss out! Enough said about this book, since I haven’t finished my reading yet. I will update this post once I finished reading this. saya nak tau, di mana ya saya boleh dapatkan buku ni? atau you boleh tolong belikan untuk saya satu? Sorry that I never noticed this comment until now! I saw this book at Kinokuniya, KLCC! you might want to go there and explore, around Finance and Investment section (particularly topics about risk management and hedge fund).